This feature is going to be expanded periodically. I will let you know when I add to it. 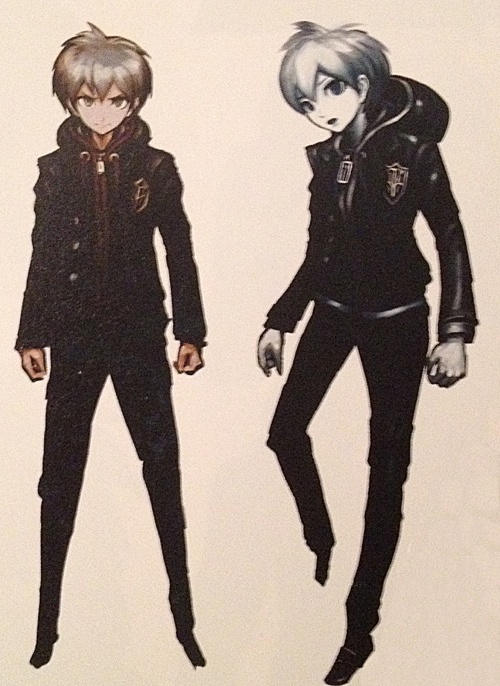 These are all taken from the official art book, accompanied by comments from the game's character designer, Rui Komatsuzaki. Komatsuzaki: From the planning stages we wanted a protagonist lacking much individuality. That's why it was much more difficult designing him compared to the other distinctive characters. At first, we intended the adventure part of the game to be seen from a third-person camera, so I made him wear a hoodie with an interesting design, thinking the player was going to see his back a lot. After that, I added some character to his hair by adding an "antenna", and highlighted his herbivore nature by making him short. His coloring is subdued, but I used a color palette I especially like. 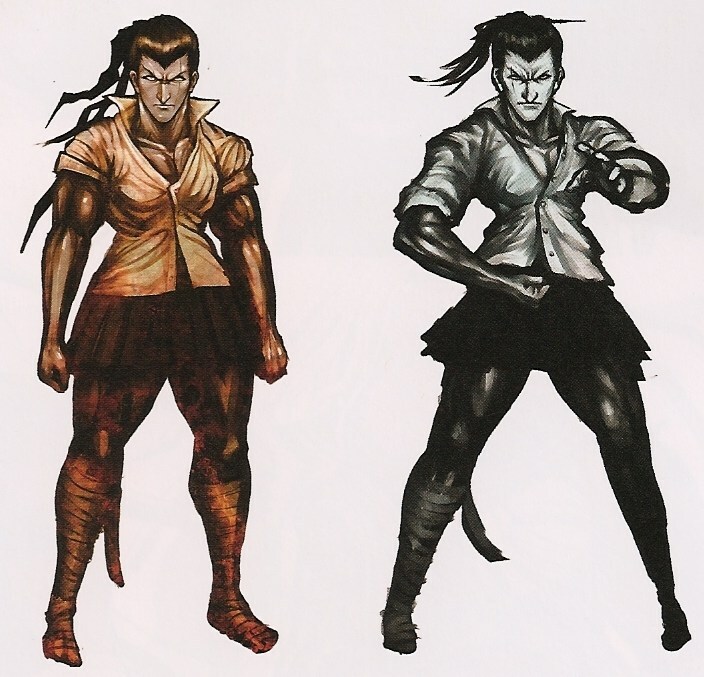 Komatsuzaki: The first character designed, even prior to the protagonist, and served as the basic model for the game's male characters (Sayaka Maizono was the base female character). That's why he features a more standard body type, and a height of 175cm (rubber-soled shoes included). As for special characteristics, that would probably be the goatee. I'm a fan of the punk genre myself, so I designed his outfit with details I personally like. 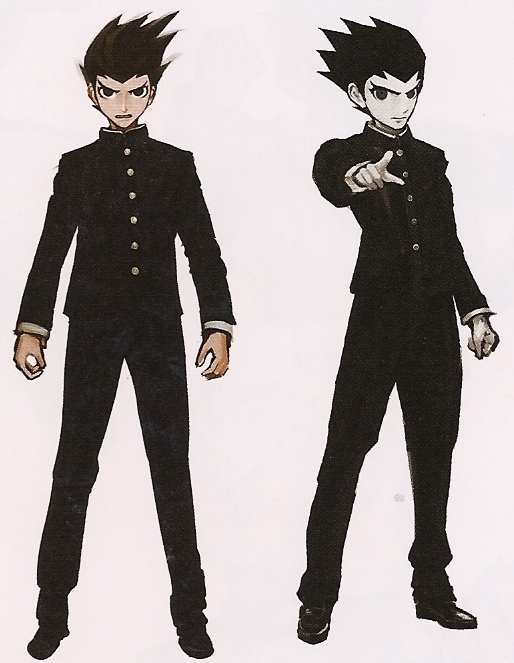 Since we turned back to his and Maizono-san's designs consistently from the very early design stages, we grew tired of them and they ended up the first characters to go in the actual game. That is truly a sad existence. 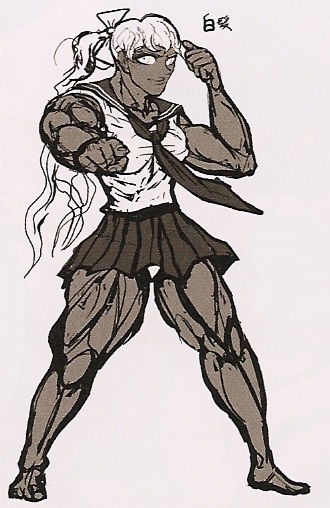 Komatsuzaki: Much like Kuwata, she's the base for the game's female characters. At first she wasn't an idol, but occupied a general graceful, well-mannered princess-type position. At one point in the initial design stages she was even a plump character. 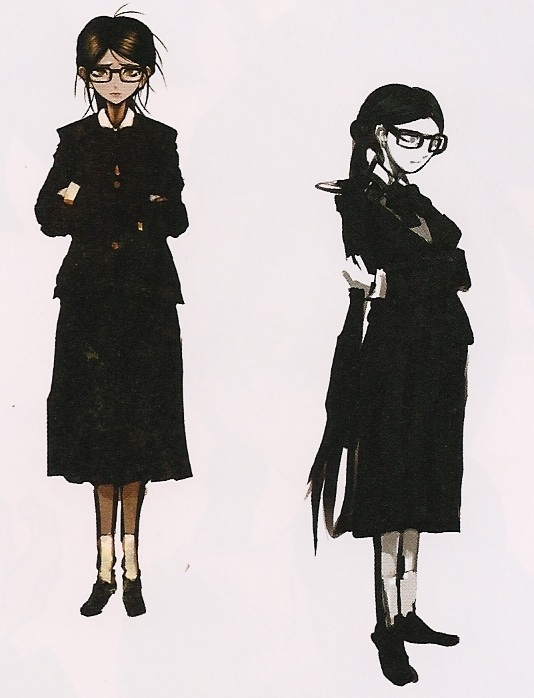 Out of all the characters, I think her design is the most orthodox. 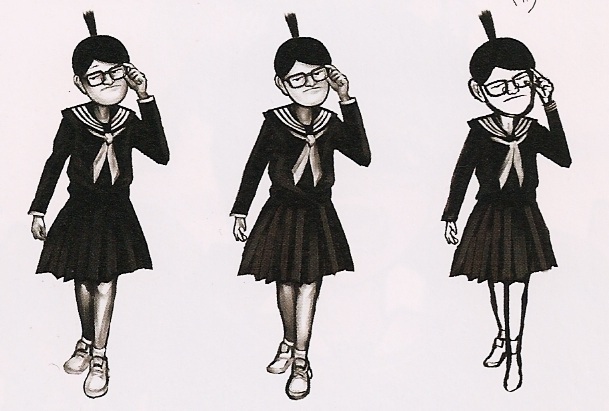 Her job as an idol is a strong characteristic feature, but there was nothing in the story that affected the details of her clothes, so her design turned out to be a basic cute young girl. If forced I'd say her expressions, rather than her design, is what characterizes her. All of the game's characters are very expressive, but hers are relatively different from what you'd first except from such a character. I think I had most trouble drawing her scared expression. Komatsuzaki: Among the female characters, this was the one who was the most difficult. We decided to have a mysterious girl from the very beginning, so I thought about giving her pale coloring and dark, monotone clothing. However, after we decided on having "Psycho Pop" as our design concept, I was asked to avoid monotone and use bright colors so I made her entire design based on purple tones. At first, I thought that her clothes should be vastly different from the other characters, so for a while they were based on a salopette skirt design. Her gloves were there from the planning stages, and her double jacket was added to highlight her role as a detective, bringing us to her current outfit. I couldn't decide between her current hairstyle and a short one, and since our producer thought both looked nice he suggested a hair cutting scene in the middle of the game. We ended up ditching it. Because she's set up as a double heroine with Maizono, her long hair also serves as a shared feature between the two. Since she's the heroine who survives to the end, her design took time and I grew to like it quite a bit. 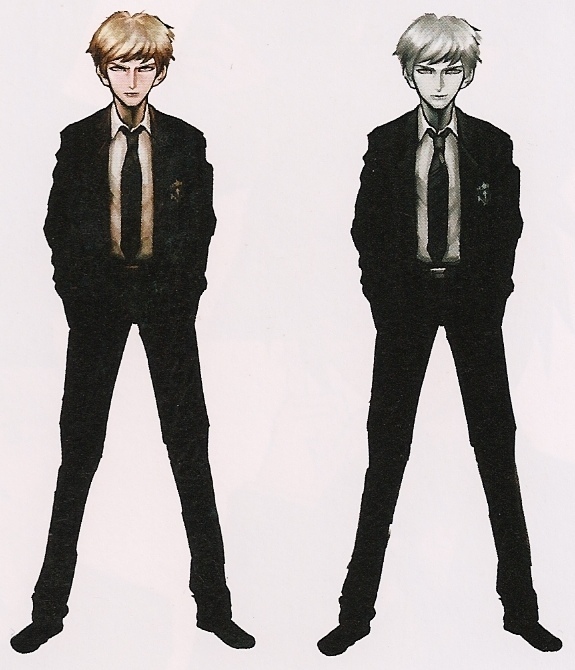 She's always cold towards Naegi, though, so I'm not sure how good a heroine she is. 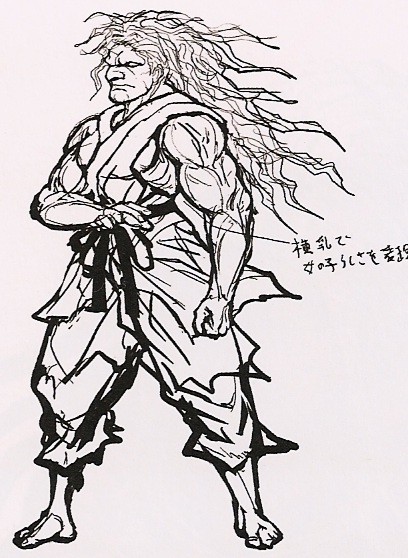 Komatsuzaki: His design gave me almost as much trouble as the protagonist's. From the very beginning we planned him as a "cool" character, but since I am not very good drawing pretty girls and boys, Togami was the character I did the most retakes on. When I read the game's plot and realized he was a cruel dark hero, I thought of dressing him in the biker fashion I like so much. I was asked to make his position as a heir easy to understand, though, so we ended up with his current outfit. At first he was even more the protagonist's main rival than he is now, but when Genocider Syo came into the picture we had to give him glasses. The poor thing. Komatsuzaki: A goth-loli character. Has been consistently goth-loli since the planning stages. 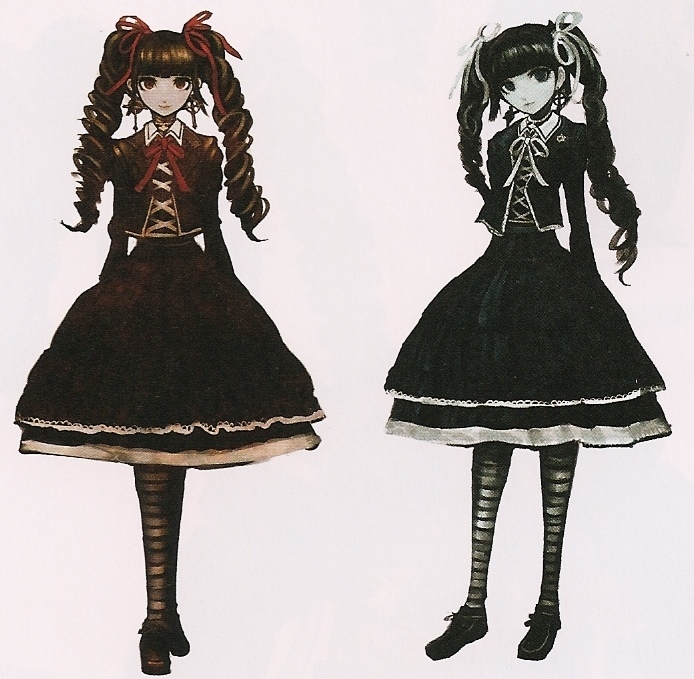 I have a personal interest in goth-loli fashion, so the design advanced to its final stage without much deviation. It's just that, since goth-loli means many ornaments and emballishments, she became a burden of a character later. It was also a bother drawin her twin tails. By the way, the setup is that they're a wig she can remove as is. I wanted to make her more doll-like than the other characters, so I lowered her skin's saturation considerably. She is relatively tall because she's of average height but wears high heels. Komatsuzaki: Ishimaru was first set up as a hot-blooded exceptional student. His role as a hall monitor came later, but the basic plan stayed the same. I was asked to depict him as enthusiastic to the point of being mad, with black googly round eyes. At first his hair was longer and stuck up, but in order to highlight his madness we made his design military-based, put him in a school uniform and gave him short hair. Slowly, he became looking much more like a soldier. He's a character rich in expression, and I had fun drawing the many face patterns his sprites required. Ishimaru overreacts to everything, but more than anything I tried giving everything I had when drawing his crying expressions. Komatsuzaki: Probably the character most different from the first impression players get. She's based on the literary girl we had since the first planning stages, but I never imagined she would turn into such an intense character. Together with Genocider, she has the most facial expressions in the game. The process for deciding on facial expressions in this game involved first making rough designs for expressions requested by scenario-writer Kodaka, and then, after reading the actual script, adding more expressions in case there aren't enough. There isn't a single character who ended up with less expressions than was originally requested. In other words, I just ignored the project's schedule by adding more expressions for every character. I felt the pressure most in Fukawa's case - she had a lot of expressions to begin with but I still thought there weren't enough. Much like Monobear -- I think ever moreso than him -- she represents this game's worldview. We also have Sawashiro-san's enthusiastic voice acting, and so she's my favorite character in the game. Komatsuzaki: Fukawa is a unique character all by herself, but with Syo included we managed to make her 10 times more so. 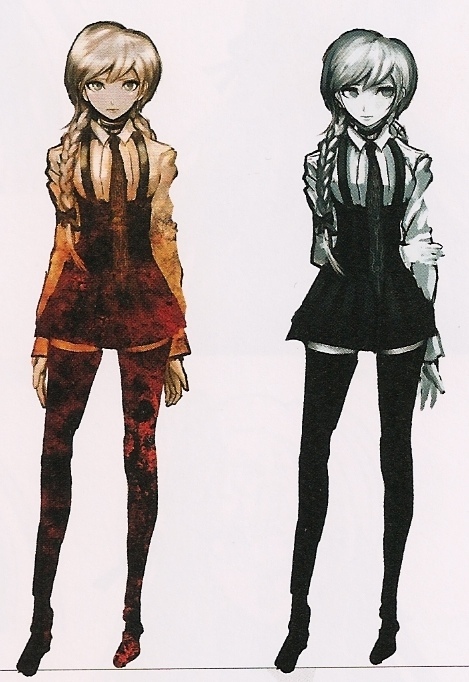 When I read the script, I naturally thought it would be incredibly tough to make such a severe personality change using the same character design, so my original plan was to base Syo on Fukawa's design but change it considerably. I fell back to the current transformation after being told having them look too different would be messy since she transforms back and forth so often. We decided to have her hide a weapon on her body from the very beginning, but I first we thought it would be a orthodox one, like a knife. But, once we decided it should be in a holster under her skirt, I found a real scissors holster and her weapon was decided.